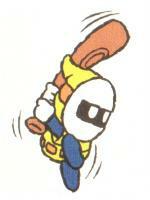 Sluggers are a type of yellow Bandit that first appear in Super Mario World 2: Yoshi's Island that often appear alongside Green Gloves as part of the Baseball Boys. Sluggers use their baseball bats to return Yoshi Eggs that Yoshi throws at them, which will push Yoshi backwards upon contact, but can also be jumped on. This mechanic is occasionally used as a method of obtaining certain Smiley Flowers. As well as returning any Yoshi Eggs thrown at them, Sluggers will also return Chomp Rocks and seeds spat from a Watermelon. Sluggers cannot be grabbed by Yoshi's tongue, but can be defeated by Ground Pounding or jumping repeatedly on them. 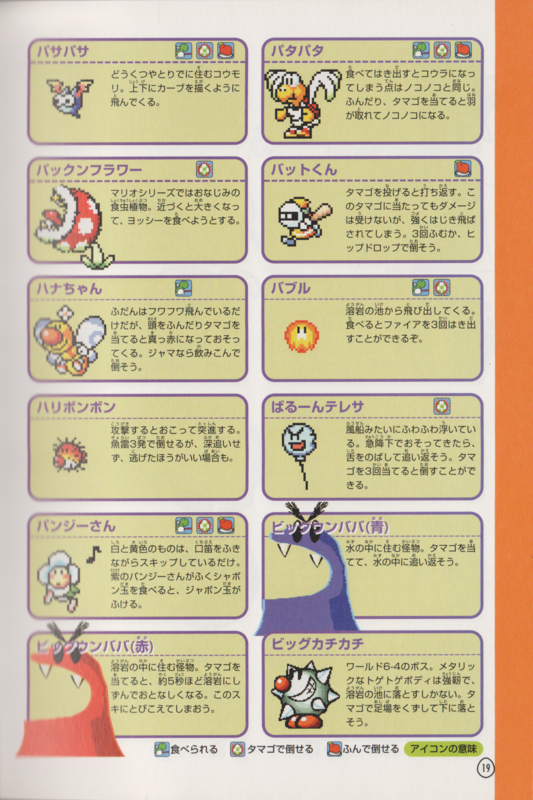 Sluggers later appear in the remake of the original game, Yoshi's Island: Super Mario Advance 3, and also in Yoshi's Island DS, in which they act identically to the first game. In Super Smash Bros. Ultimate, a Slugger and a Green Glove appear on a Spirit. Bitter From бита (baseball bat). This page was last edited on March 30, 2019, at 15:52.